Side on profile portraits are best completed at our larger sizes. 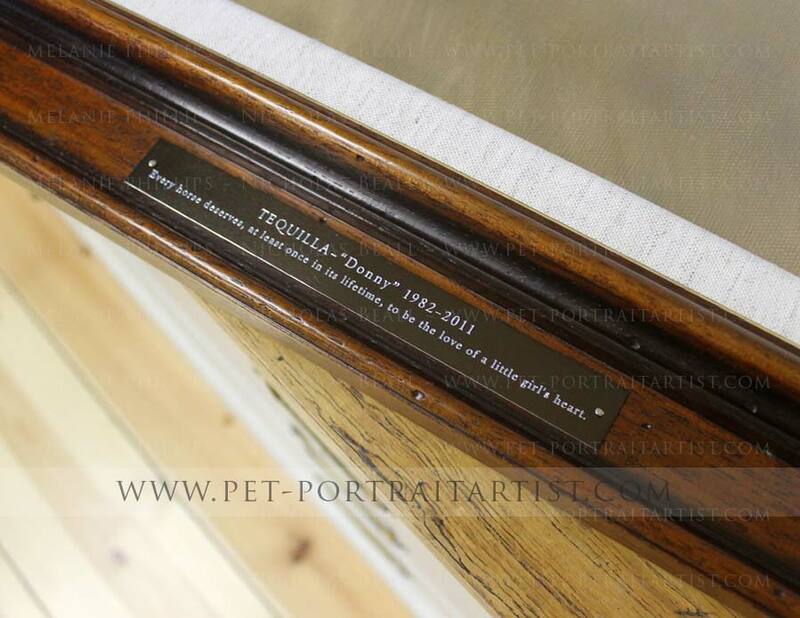 This portrait of Tequilla was actually painted on a square canvas which can look very modern and contemporary. Side on profiles can work with an out doors scene behind or a studio style background, each choice can compliment the horse well. 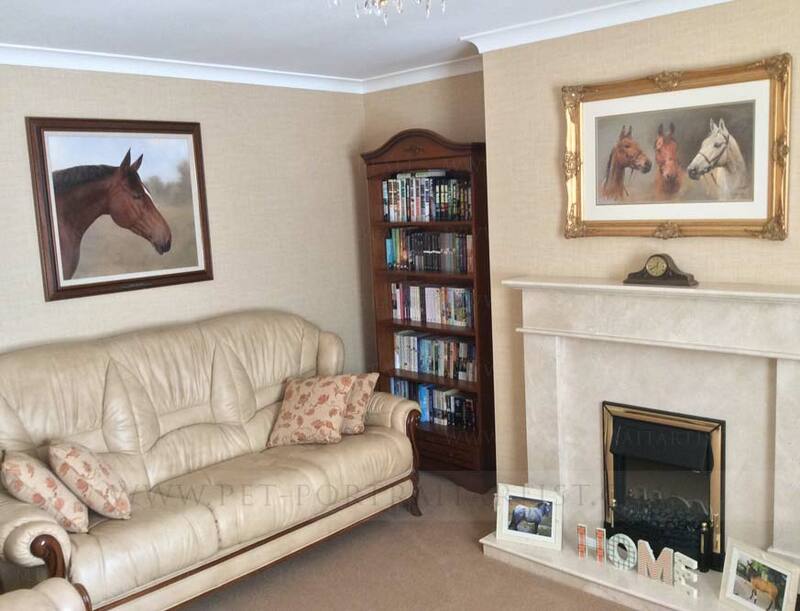 Nicholas specialises in painting horses in oils on canvas and if you would like to read more about the commission, keep on scrolling to find out more. We would also be thrilled if you could share our page too! 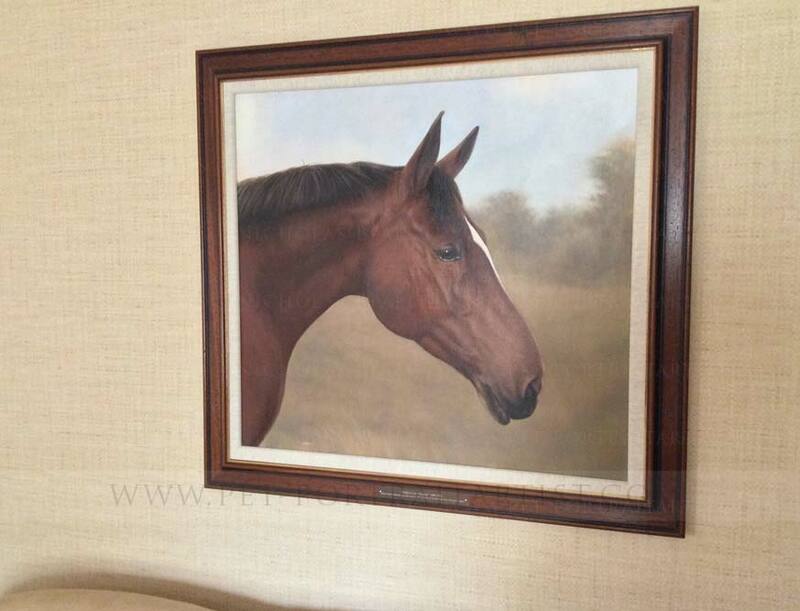 Jaime Todd from Ireland, enquired via email about a horse oil portrait and commissioned him in 2014 to paint her stunning horse Tequilla (Donny). Donny very sadly passed away and was very much loved and missed by the entire family. Jaime sent us lots of photos and wanted Donny depicted as a head study, fairly large in size with an outside field / grassy feel in the background - although not too detailed as she wanted Donny to be in full focus of the painting. Jaime asked Nicholas to use one photo for the basis of the painting and another for Donny's true colour. 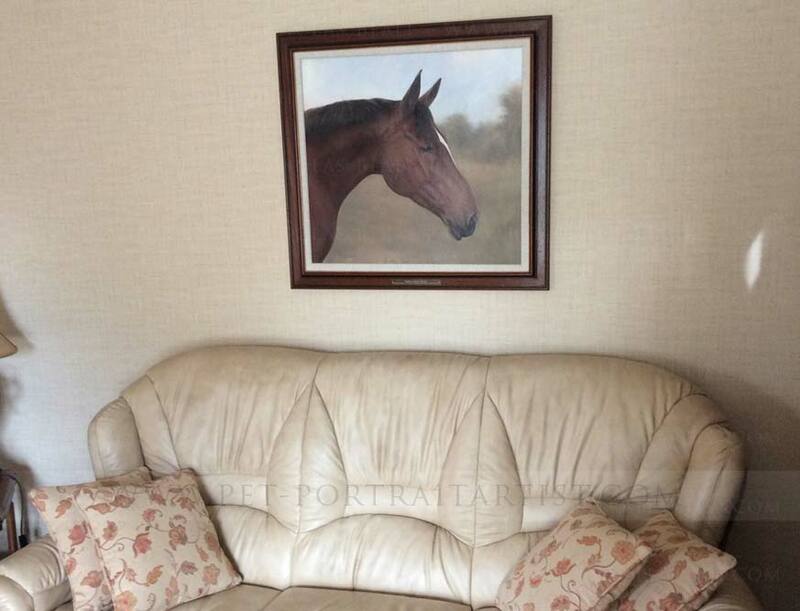 He painted Donny on a 20 x 20 size linen canvas to work with a particular space with Jaime's home. Jaime sent these amazing emails when the painting arrive, plus she took photos of the portrait when it was framed. Scroll down to see them!. 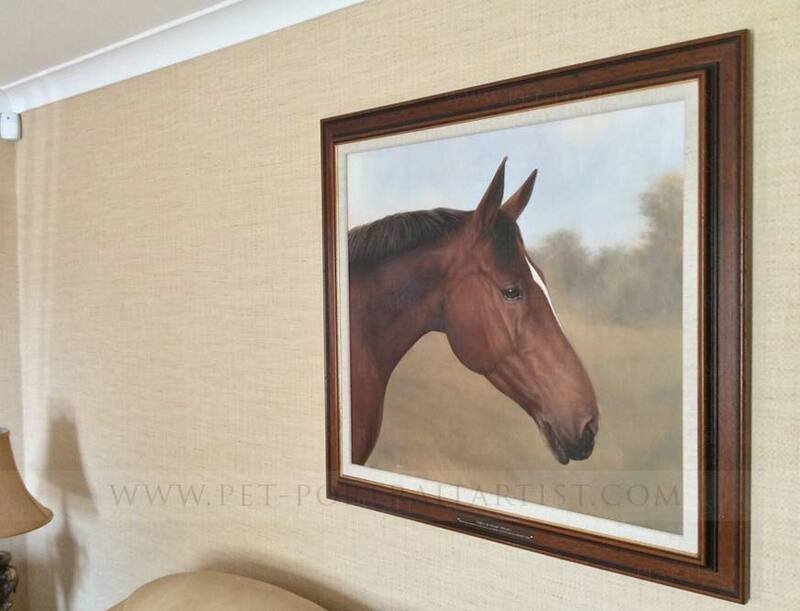 My Dad has just been on to say that the portrait has arrived safely and in perfect condition. Dad is seriously impressed with your packaging!! I’ve obviously not seen it yet but Dad is quite choked up and My Mum is crying so I’m guessing that’s a great sign!! I will email you later when I get home to see it! Tks so much meantime!! I hardly know what to say … nothing is going to adequately express how we feel about the Portrait. It’s just perfect in every possible way and I’m so grateful to both of you. The richness, the character, the expression, it’s just amazing and it’s the next best thing to having her back – it leaves the best of our photographs way behind and we will treasure it for what it is, both a fantastic work of art and a wonderful impression of a memory we can keep alive. I’m so glad that I spent the hours that I did trawling on line for someone to do a portrait and although your wonderful website was what first drew me to you both and the fact that I could view the previous work, the service, both professional and yet so friendly, down to earth and honest made it perfect from start to finish. Hopefully we can work together again in the future as I have another smaller portrait in mind of a pony that was a rescue case that I gave a home to, he was just 29 inches and a mix of blue roan and spots so I’m thinking that with his colouring he may look best in pencil! Meantime thank you 1000 times over for everything and will be in touch soon! 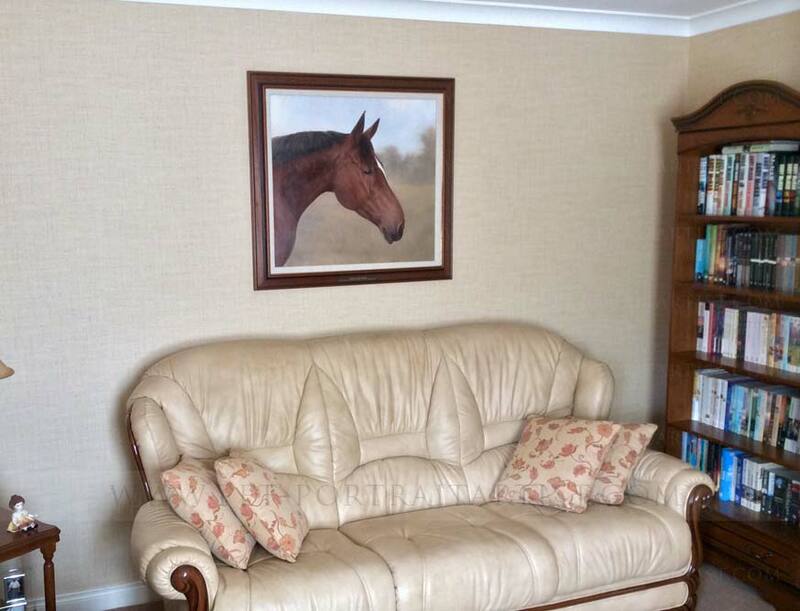 Finally we have the portrait hung and some pictures for you. Everyone that has seen it so far are just speechless and cannot believe how vivid and alive she looks. We have shed some more tears and are so delighted with the final result. We decided we liked it best on the wall by itself and not above the fireplace in the end as it has such presence and we preferred nothing to take away from it. As it is now, it commands your attention the moment you open the door which is perfect. Once again my heartfelt thanks to you both for everything and for this wonderful piece of art which I can treasure. Jaime very kindly took some photos of the painting when it was displayed in her home. We cant thank Jaime enough for taking the photos for us and we really appreciate her allowing us to use them here for everyone to see. 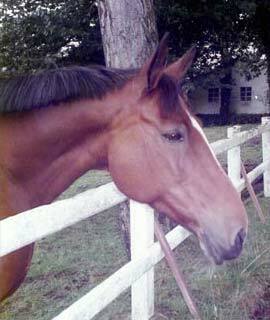 Hoping that you have enjoyed reading about Jaime and her horse oil portrait of Tequilla. 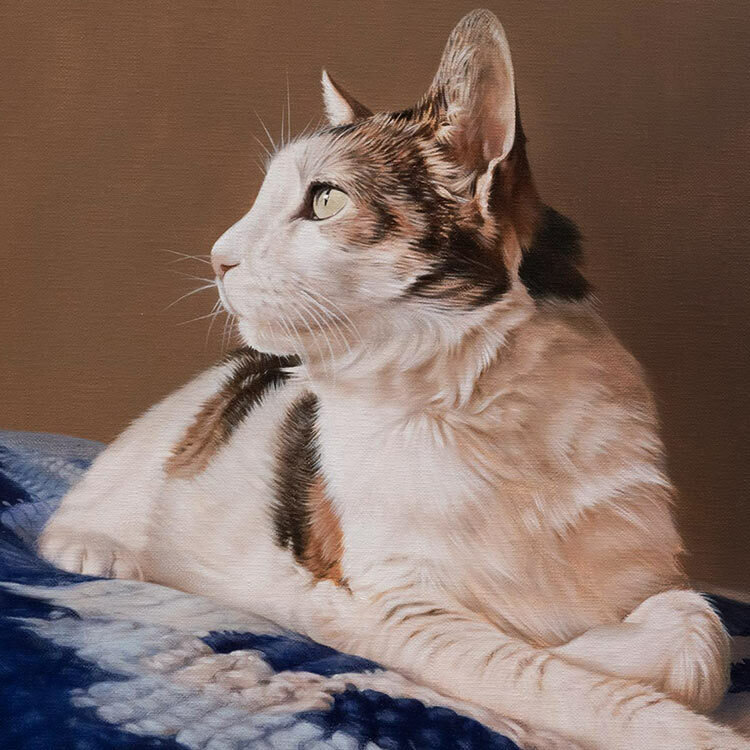 Our favourite part in her testimonial was when she said that the painting - it leaves the best of our photographs way behind - Many of us have a handful of photos of our beloved pets, but rarely does just one capture them perfectly. Our aim here is to create an oil painting capturing the pose, a beautiful background, the correct colouring and even altering manes, plaits and forelocks. 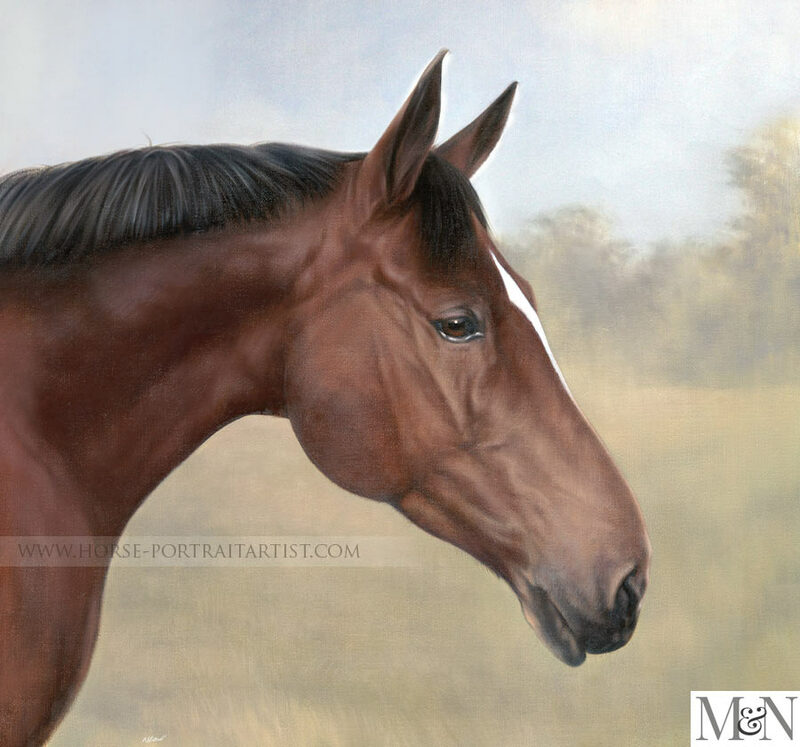 Most things are possible and if you have any ideas for an oil painting of your horse, why not email us from our horse portraits contact page today.